Christmas went quite well I think. Even with our ever so limited budget. Because our wallets and bank accounts were so slim, I had to improvise on a few gifts this year. My mother has a cute little Pekingese named Betty, and I really wanted to get her a doggy sweater. The doggy boutique downtown had a great selection but they were charging prices a la your-first-born. So instead, Nikki volunteered her time and knitted an even cuter pink fluffy sweater for less than a cheap lunch. Yay! Meanwhile, my mission was to give my sister a computer. She mentioned wanting one for her home office some months ago, and I thought that would be a perfect gift. Since I had enough spare parts I built her a machine suited well enough for her purpose. I commandeered an old HP, and decided to give it a little makeover. But, I wanted her PC to look new, even if it wasn't. Supplies purchased for this mod came in under $10 for the spray paint, which was all it needed. I would have loved to add a window and cathode, but time was about as tight as money. 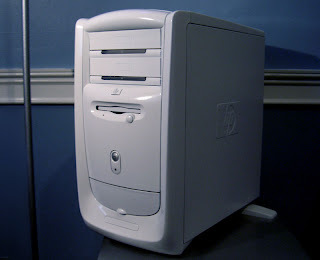 As you may remember, the old HP cases that were somewhat ubiquitous at one point are not expecially attractive. I never really liked them even when they had just come out, let alone years later. So my vision, and challenge, was to create a cleaner look for the case and peripherals by painting the aged and yellowing plastic. 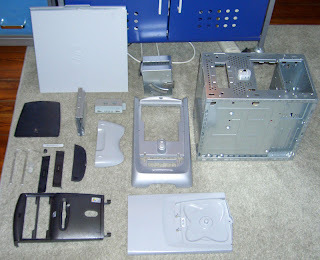 First step in this was to separate all of the case components from the metal chassis. There were actually a few more than I had anticipated. The plastic on these cases came in three colors, being gray, silver, and a transparent "charcoal" or something. The few minute clear pieces would remain unpainted as they were being used to refract LED lights. After the separation anxiety, each part to be painted needed to be sanded down lightly for better texture, and cleaned from the dust. I ended up washing all the pieces and wiping them off. They were left alone to dry overnight before painting, just in case. 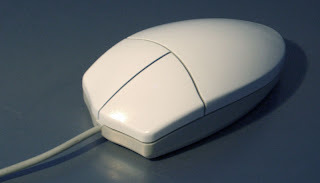 I pulled out an older Microsoft keyboard and a mouse to get painted as well. The keyboard needed it the most, due to some black marks that just wouldn't come off. 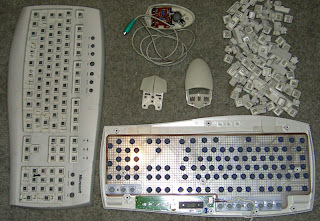 I took off all the keys and dismantled the keyboard and mouse to prepare them for the painting process as well. I was initially going to paint both the bottom and top parts of the mouse and the keyboard, but decided against it. Since the keys themselves had to remain unpainted, because I don't think my sister would appreciate not knowing which key is which, I chose to leave the bottom parts of both peripherals the original color. This would create a contrast in color that would match the difference between the keyboard keys and body. The time for painting had arrived. I don't think I have mentioned that my color choice was white. But not the "ivory" white of old plastic mind you. Rather I chose a clean bright white in order to give the whole case a uniform and glossy finish. This would also lend the case a slight "Mac" flavor. Hey, I know that's uncharacteristic of me, but this old HP needed all the help in could get! The mouse came out just fine and I was happy with the end result. Next up was the keyboard. After painting the cover, I noticed that all the keys were dirty (especially on the sides). Only one way to fix that. 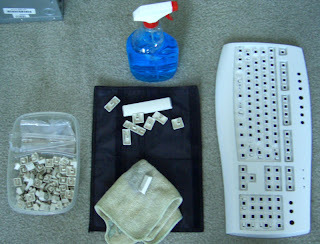 That's right, I got out my trusty cleaning spray and rag, and proceeded to clean each key individually. There it is. One key at a time. It was somewhat tedious to be sure, but it didn't actually take that long. 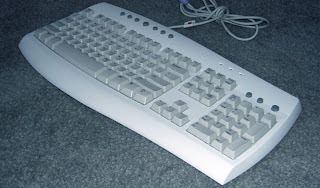 Besides, it was worth it to have an old keyboard transform into something that looked newer, and even smelled new when it came out of the box on Christmas Eve! Voila! 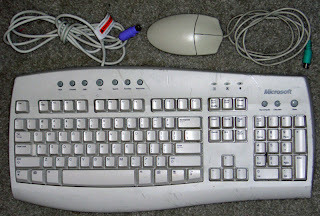 One de-Microsoftized keyboard coming up. Next up were all the little (and big) pieces for the PC case. I made sure to do multiple thinner coats to avoid drips. The transparent components were painted on the back as well as the front to avoid any light coming through the back. While all my case components were drying, I took that time to assemble the internal parts of the case. I fired it all up to make sure everything was still operational, and came upon a no-post problem that made me more than a little mad. As it turned out, while the parts were sitting in a closet for two months, the CPU for some reason decided to fry itself. I'll never understand how those things can happen. After hours and hours of switching out RAM, video cards, motherboards, and power supply units, I finally realized it was the processor. But at least I had found the problem. I switched it out, and bingo! By then the paint certainly had plenty of time to cure. Here she is at last! All put together, and clad in white. I think it looks pretty good actually. And to match the new look of the case, I customized the Windows user interface too. I gave her the appropriate software package: Firefox, Thunderbird, Audacity, FreeMind, Ad-Aware, OpenOffice, TuneXP, etc. And with that out of the way I grabbed a few programs from WinCustomize and gave everything a new look. 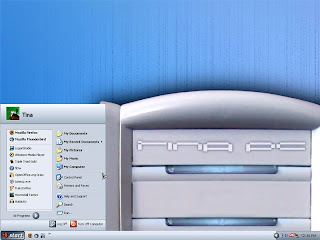 Naming the rig after its recipient, the Tina PC deserved its own wallpaper, which I created using a photo of the case itself. I then changed the UI using WindowBlinds, and put up a boot screen up using Bootskin. 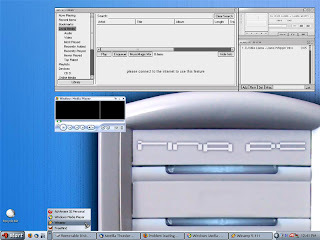 Add to that a matching logon screen using LogonStudio and new cursors using CursorXP, and you've got yourself a newly restyled computer both inside and out. I think all the elements matched up nicely. I'm fairly satisfied with the result given the available resources. With more time and money I would have gone further, naturally. 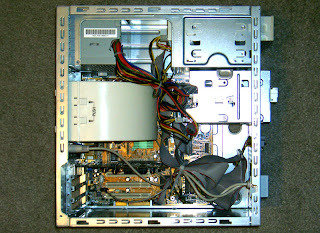 But I think this is an example of how and old computer that would have been tossed out by many got a new look and a new purpose. So go and grab that old junker and re-purpose it for file storage, a media PC, or give it away to someone who really needs a computer for the basics. There is always something you can do with an old PC, no matter how old it is. It's true. Just have fun with it, and remember to be nice to all your computers! Update: I have received some nice comments on this article on Digg, and I must say I'm flattered. If you like this article, then by all means, head over to Digg and digg it!